Astra 2F before launch. Photo: ESA/CNES/Arianespace/Optique Vidéo du CSG. [Via Satellite 10-23-13] SES has signed a renewal of its contract with Sony Entertainment Television (SET) Asia. The new agreement will enable SET Asia to serve its subscribers in the United Kingdom and Ireland at SES’ prime orbital arc of 28.2/28.5 degrees east, as well as distribute its platform to affiliates across Europe. SES serves almost 13 million satellite households across the U.K. and Ireland from its constellation of four satellites positioned at this orbital arc. 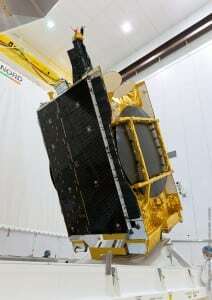 The company is in the process of a full fleet renewal: Astra 2F was launched September 2012 while Astra 2E has just launched successfully on Sept. 30, 2013. Astra 2G will be launched in the first quarter or 2014.